Next on tap – the Chinese Museum of Clean Air? 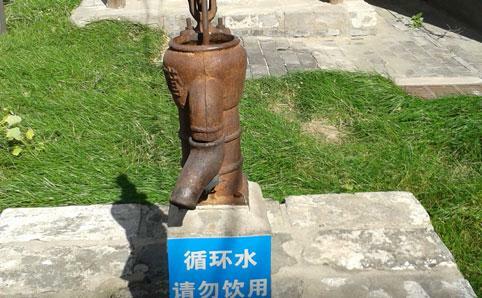 The sign beneath this outdoor water pump at the Beijing Museum of Tap Water supposedly warns visitors not to drink the water. China, you may have heard, has been on a building blitz of gigantic proportions. Apartment buildings, skyscrapers, business parks, gated communities, monuments, museums, theme parks – all the infrastructure needed for burgeoning masses of proletarians turned consumers. Among all these oversized projects is the humble Beijing Museum of Tap Water. It’s a most peculiar choice of museum subject, given that nobody in that huge, populous country enjoys plumbing that delivers potable water. That’s right. No drinkable tap water in the whole country. Even after it’s boiled, there’s too much sediment to drink the stuff. Even with filters, it’s too risky to imbibe. No filter can eliminate all the pollutants coming out of Chinese faucets, which include sewage, heavy metals, lead, rust, nitrates, nitrites, bacteria, viruses, parasites and extreme levels of chlorine. Imagine what sort of exhibits might be displayed in a Chinese Museum of Clean Air – photos of skylines doctored to scrub away the murky fog that passes for air, an assortment of face masks and sets of lungs blackened simply by breathing.